As urban density increases to cater for a growing and changing population, Knox City Council is committed to working with the community and industry on improving design and development outcomes in the municipality. 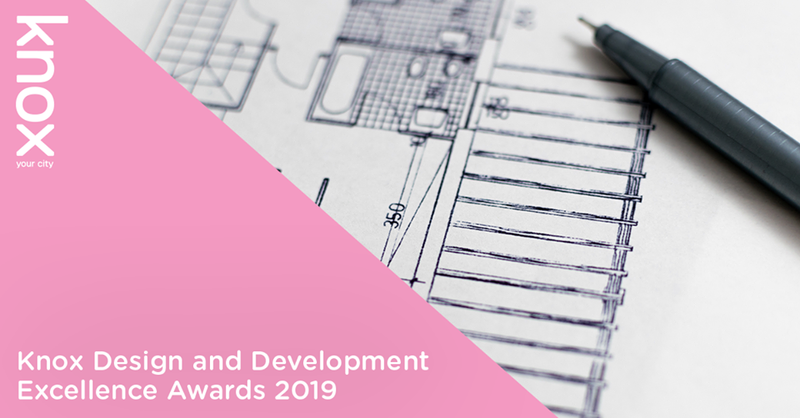 The inaugural Knox Design and Development Excellence Awards 2019, will celebrate excellence in the design and development of the built environment in the City of Knox and you are invited to participate. You can make a nomination through this online form. Projects eligible for an award are required to have been completed (i.e. constructed) between 1 January 2016 and 1 January 2019. The award categories and judging criteria are, in part, aligned to the preferred housing typologies within the areas defined in the Knox Housing Strategy. The Strategy designates areas as either Bush Suburban, Local Living, Knox Neighbourhood or Activity Area and sets out the preferred types of housing (detached dwellings, dual occupancies, villa units, townhouses and/or apartments) for each area. The Strategy is complemented by the Knox Residential Design Guidelines, which provide detailed guidance for the different residential areas and types of housing described in the Strategy. The Guidelines seek to improve the quality, design, sustainability and accessibility of residential development. Award categories will also be offered for industrial, commercial and institutional design and development. The Knox Award will be selected as an exemplar from all award winners. Awards will be presented to the Architect / Designer of the winning projects. In relation to residential developments, refer to the Knox Housing Strategy Residential Policy map to locate the property you are nominating, the residential type area classification and the preferred housing type and design guidelines for each area. Preferred housing type - single dwelling, dual occupancy (where minimum subdivision size requirements can be met). Is consistent with the Knox Housing Strategy and Residential Design Guidelines for Bush Suburban areas. Exhibits design excellence and functionality in relation to dwellings, outdoor spaces and garden areas. Demonstrates environmentally sensitive design and development principles. Contributes to the protection and enhancement of environmental and biological values, including significant indigenous and native vegetation. Enhances the Bush Suburban character. (Small lots – under 1000m2) Preferred housing type - detached dwelling and dual occupancy. (Large lots –1000m2 and above) Preferred housing type - unit and villa units. Are consistent with the Knox Housing Strategy and Knox Residential Design Guidelines for Knox Neighbourhood areas. Dwellings, outdoor spaces and garden areas exhibit design excellence and functionality. Demonstrate environmentally sensitive design and development principles. Enhances the ‘green and leafy’ Knox Neighbourhood character. (All lots) Dual occupancy, villa units and townhouses. Is consistent with the Knox Housing Strategy and Residential Design Guidelines for Local Living Areas. Enhances the ‘green and leafy’ and ‘village feel’ around larger shopping areas. (All lots) Villa units, townhouses, apartments and mixed use. Additional planning controls and covenants apply based on approved Structure plans. Is consistent with the Knox Housing Strategy and Residential Design Guidelines for Activity Areas, or the relevant approved Structure Plan. Exhibits design excellence and functionality in relation to buildings, outdoor spaces and garden areas. Balances more intensive residential development of Activity Areas with a ‘green and leafy’ character. Is consistent with the Knox Landscape Plan Guidelines. Complements the built form and surrounds. Exhibits design excellence and functionality in relation to outdoor spaces and garden areas. Demonstrates environmentally sensitive design principles. Values existing vegetation and existing canopy trees, by retention and integration into the site design. An exemplar project, selected from the winners of all categories. There are no fees associated with submitting a nomination to the Knox Design and Development Excellence Awards 2019. Up to two recognised design industry professionals. Mayor of City of Knox and two other Councillors. Knox City Council – Director City Development. Knox City Council senior design professional. The award recipients will be announced at the Knox Design and Development Excellence Awards event, Knox City Council Civic Centre, 511 Burwood Highway, Wantirna South on Thursday 27 June, evening 2019. The following terms and conditions apply to the Knox Design and Development Excellence Awards 2019. Entries are open between 28 January 2019 and 31 March 2019. All nomination materials must be submitted electronically. The jury may choose not to present an award in any or all categories as it sees appropriate. Commendations may be awarded in all categories as seen fit by the jury. All projects should be compliant with relevant planning legislation and permit requirements. Any material provided with nominations may be used by the City of Knox for promotional purposes. Nomination of projects absolves Knox City Council from any liability relating to confidentiality or intellectual property matters that may arise in the future. Knox City Council reserves the right to retain, publish and exhibit any images or material submitted with the nominations as it sees fit. All entries will be displayed in the Knox City Council Civic Centre for 4 weeks (1 week prior to the awards event and 3 weeks following). Winning and commended entries will be marked. Only entrants are invited to the awards presentation ceremony and exhibition. Winning entries will be published on Knox City Council’s website and other media outlets. All applicants must be the moral rights and copyright owners of the nominated project and its submission materials. If not, they have the appropriate consent for work to be reproduced, exhibited, published, communicated and or adapted by the City of Knox with authorship being attributed to the owner. By nominating a project, the applicant agrees to all terms and conditions listed.